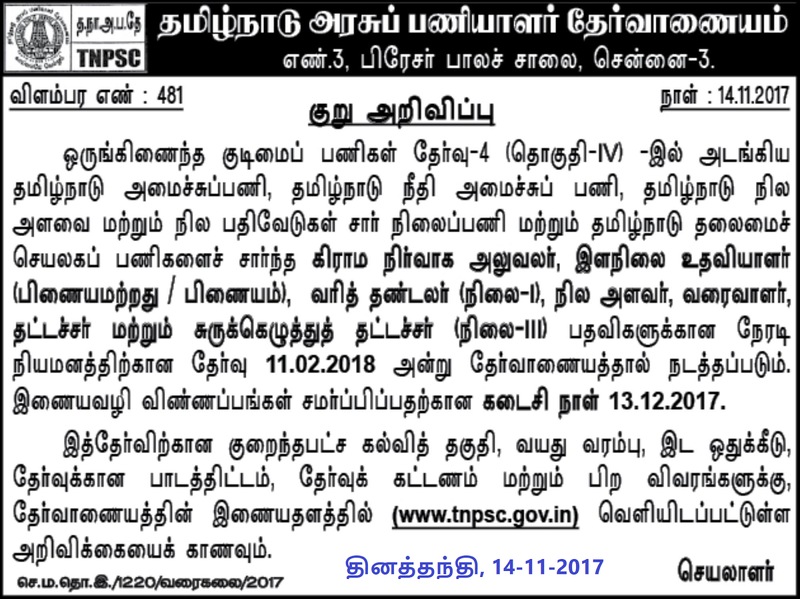 Tamilnadu Public Service Commission has published its official notification for the new Combined Civil Service Exam IV or CCSE-IV which includes both Group IV and VAO posts. The short notification has been published in the newspapers. The detailed notification is published in the TNPSC Official Website www.tnpsc.gov.in/latest-notification.html . The Tamil Nadu Public Service Commission has informed in a recent press release that there will be no changes in the existing minimum and maximum age limits for both VAO and Group IV Posts. Regarding VAO posts, the minimum age limit will be 21 years and maximum age limit will be 40 years as followed in previous year examinations. Previously, Tamilnadu Public Service Commission was conducting Group IV and VAO Exams separately. 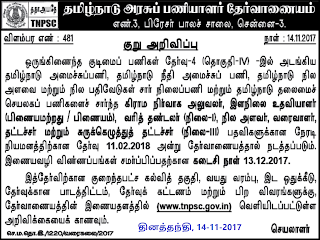 On 02-11-2017, TNPSC has made an important announcement saying that it has decided to conduct both Group 4 and VAO Exams as single exam which will be called as Combined Civil Service Exam - IV (CCSE-IV). Group IV Exam is applied by 15 lakh candidates and VAO exam by 12 lakh candidates. Since the education qualification is mere SSLC, 60 % of the candidates applying for Group Exam also apply for VAO Exam.TNPSC spend about Rs.15 Crore to conduct each examination. For conducting an examination, TNPSC require huge manpower of education and revenue departments. When a candidate doesnt get his/her desired post, he/she select his desired post in the next examinations. In this way, about 20% of the posts become vacant and TNPSC again has to conduct examination for the vacancies. 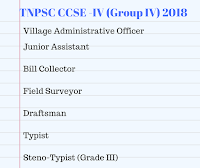 In order to avoid all these, TNPSC announced conducting both the Group IV and VAO exam as a single exam. Since separate departmental training is given for Village Administrative Officers as other departments, so there is no need of including Village Administration related portions with in this combined Examination Syllabus. It is mentioned in the Dinathanthi newspaper as "பிற தேர்வுகளில் அந்தந்த பதவிக்கான பணிப்பயிற்சி அளிப்பது போல், கிராம நிர்வாக அலுவலர் பணிப்பயிற்சி தனியே அளிக்கப்படுகிறது. இதனால் இதுகுறித்த பகுதி போட்டித்தேர்வுக்கான பாடத்திட்டத்தில் இருக்கவேண்டிய அவசியம் இல்லை என்றும் கருதப்படுகிறது." What will be the total number of vacancies in upcoming CCSE IV Exam ? 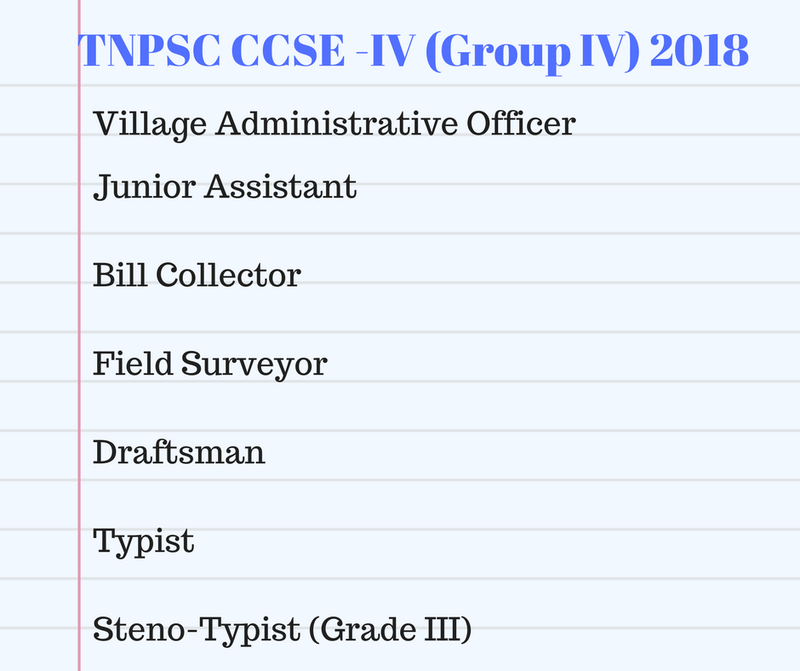 Since both Group 4 and VAO posts are combined, the total vacancies in the upcoming CCSE IV Exam may be higher. We may expect about 8000 plus vacancies in the forthcoming CCSE IV notification. Regarding syllabus, most probably, the existing Group IV Syllabus may be maintained or slightly modified (let us wait for the notification).